The Gay Gamer: Which games are you playing this weekend? Before this holiday weekend began, my plan was to play a trio of games I've been meaning to finish for quite some time: Deadly Premonition, Final Fantasy: The 4 Heroes of Light and Pokemon Black. Instead, I've been playing a pair of old Famicom games, Chack'n Pop and Door Door (below), via emulation, as well as one other game I can't tell you about at the moment. 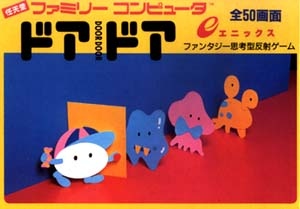 Door Door has some disgustingly adorable box art, doesn't it? Actually, I could tell you about it, but I don't want to, as I'm saving its unveiling for a to-be-published-at-a-later-date post. Anyway, those are the games I'm playing this holiday weekend. What are all of you playing (assuming, of course, you're playing games at all)? I'm about to play Super Street Fighter IV. Didn't play the original release, but I like 2, 3, and the alpha games so I hope this one is good for me. Ah, let me know what you think of it, will you, Adam? I haven't played a Street Fighter game since ... Alpha? I honestly can't remember. I've always loved the series and its characters, though. Oh thats funny, I actually just bought a CIB copy of Door Door a couple of days ago, I had been looking for it for the longest time. I haven`t actually played it yet, so I`m curious to see your next post about it! Been at the girlfriends all week and read a book but hopefully finishing Dark Souls tonight so I can start on Skyward Sword. Sean: Why don't you just stab me through the heart while you're at it. I mean, a CIB copy of Door Door? Let me guess: You paid $5 for it? Seriously, though, consider me jealous! I definitely want a CIB copy of this game at some point, mainly because the box art is so great. I like the game itself a lot, too, though. It's definitely archaic, but very cute and quite unique (and fun), too. Justin: Sorry to hear you're sick, too. Hopefully you feel a bit better today. And you're working, too? Ugh, that's even worse! Anyway, I hope you feel better soon and that you get to spend some more time with Skyward Sword, too! Retr0gamer: Ah, yes, I remember you saying you were going to finish Dark Souls before you started Skyward Sword. Hope you do so soon so I can hear your thoughts on the latter!